Bishop Bob Hoshibata at the consecration service of Bishop Karen Oliveto, the first openly gay bishop in The United Methodist Church, held on July 16, 2016 at Paradise Valley UMC. On April 23, 1968, the United Methodist Church was created by the union of the Evangelical United Brethren Church and Methodist Church. Fifty years later, things are on the verge of unraveling. Every four years, lay and clergy delegates gather from annual conferences around the globe to reflect on the state of the church and to review and amend our denominational polity. The most recent General Conference was held in May of 2016, when thousands of United Methodists, including about 850 delegates, gathered in Portland, Oregon. At the outset of that conference, 115 LGBT United Methodist clergy came out of the closet and an additional 2,000 UMC clergy (including yours truly) signed a letter of support. Some 25 bishops also signed a letter requesting changes to our polity eliminating the exclusion of LGBT pastors and the prohibition of same gender weddings. Recognizing the potential for a church-wide split, the General Conference decided at the urging of the Council of Bishops to defer all votes on human sexuality until a specially called General Conference, to be held Feb. 23-26, 2019. It also empowered the bishops to create a commission to bring a recommendation to that conference to determine the way forward for our denomination. Until then, the question remains: will we be united or untied? Two months later, on July 15, 2016, the Western Jurisdiction of the UMC elected the Rev. 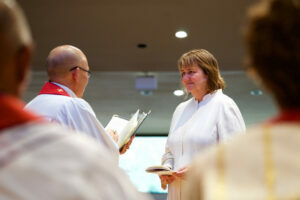 Karen Oliveto to the episcopacy, the first openly lesbian bishop in the United Methodist Church. I was privileged to attend her historic consecration service at Paradise Valley UMC that weekend. Needless to say, it has not been a smooth journey for Bishop Oliveto, as the church struggles to be fully inclusive. I rejoice that for nearly two decades Dayspring UMC has had a Statement of Welcome that includes all people, regardless of sexual orientation. Moreover, in 2015 Dayspring affiliated with the Reconciling Ministries Network, comprised of United Methodist churches that publicly welcome all people, regardless of sexual orientation or gender identity. While our denomination struggles to live up to its slogan of Open Hearts, Open Minds, Open Doors, I am grateful that Dayspring has made considerable strides toward embodying that ideal. I hope you’ll join your prayers with mine for a fully inclusive and united church.